OK, so do you want the good news or the bad news? Bad news first, it is. Sorry, but I just don’t think a four-CD live set is a good idea. With a few notable exceptions, I’m not really too bothered about live albums generally. I can understand that if you’re recording all of the shows anyway (and it’s quite easy to do that now), you might want to release some of the material for your fans. I can also understand that, to be authentic, you might want to present a whole show from introduction to encore. You might also want to showcase material from different tours; I just don’t believe that two complete shows spread over four discs is the best way of doing it. Again, this is only my opinion, but I’m not keen on songs that last for nearly half an hour either. Let’s get all the negativity out of the way now, shall we? 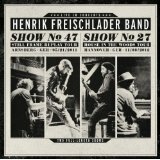 As a live act, the Henrk Freischlader Band has a huge dynamic range from pin-drop quietness to jet-engine loudness and you just can’t capture that on CD; try listening to this set on driving on the motorway or the autobahn and there are huge chunks that you just can’t hear. So, it’s fair to say that I’m not keen on the concept, but that certainly doesn’t mean that it’s all bad news; after all, this is Henrik Freischlader. Throughout the set, the musicianship is exceptional and that’s not just Henrik; Björn Krüger and Theofilos Fotiadis are a rock-solid rhythm section, while Moritz Fuhrhop’s Hammond adds another powerful solo instrument to the mix. It’s great to hear musicians improvising creatively, but the songs which work best here are the ones where the improvisations and extensions are kept to a minimum. The opening tracks “The Blues” and “Still Frame Replay” work well and the selections from the “House in the Woods”, particularly “1999”, House in the Woods” and “Breaking my Heart Again” all sound great in a live setting. There’s also a good selection of covers from Peter Green’s “I Loved Another Woman” to the Beatles’ “Come Together” via the almost inevitable Hendrix of “Crosstown Traffic” and “Foxy Lady”. For committed fans of Henrik Freischlader, this will be an essential album; there are plenty of powerful performances here and some very good songs. If you’ve seen the band live, you’ll know that Henrik is a very gifted player and has a superb raw, soulful blues/rock voice and this set captures those qualities perfectly. For the uncommitted, however, it might suffer from “Sandinista” syndrome; the infamous Clash triple album could have been a magnificent single album. If this set was edited down to a third of its current length it would make a superb memento of a Henrik Freischlader live set. If you want to hear Henrik at his best check out “House in the Woods” (reviewed on MusicRiot) released earlier his year, go out and see him live or have a listen to the wonderful new Layla Zoe album “The Lily” which Henrik produced as well as playing guitar, bass and drums parts. I’m already looking forward to his next studio album. Out now on Cable Car Records (CCR 0311-40).